Next Event – June 21st Birthday Celebration! Home / Blog / Next Event – June 21st Birthday Celebration! 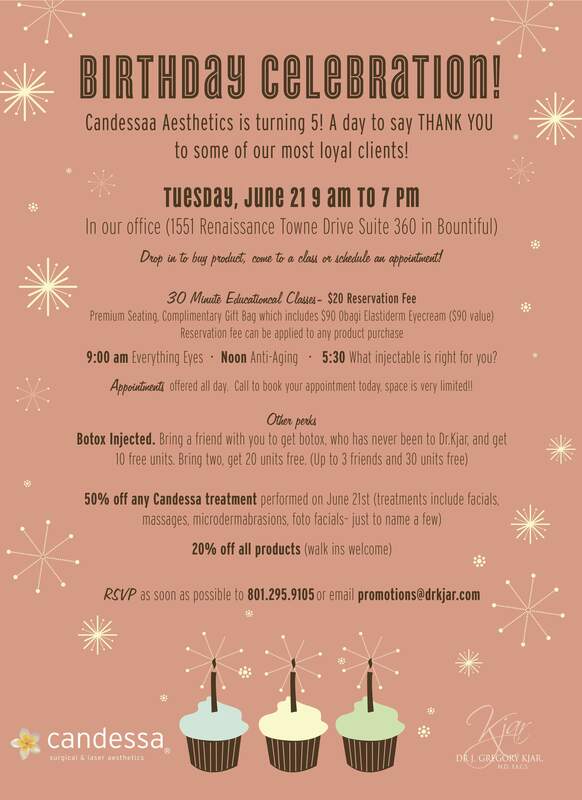 Candessa Aesthetics is turning 5! 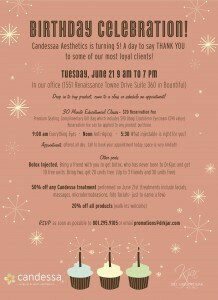 A day to say THANK YOU to some of our most loyal clients! Drop in to buy product, come to a class or schedule an appointment! Includes premium seating, complimentary gift bag with $90 Obagi Elastiderm Eyecream. Reservation fee can be applied to any product purchase. Classes offered: 9am Everything Eyes, Noon Anti-Aging, 5:30 What Injectable is right for you? Botox Injected. Bring a friend with you to get botox, who has never been to Dr.Kjar and get 10 free units of botox. Bring two friends and get 20 units free. Up to 30 units free. RSVP as soon as possible to 801.295.9105 SPACE IS VERY LIMITED!